School Library Journal School Library Journal | How Fair Is Your Maker Space? 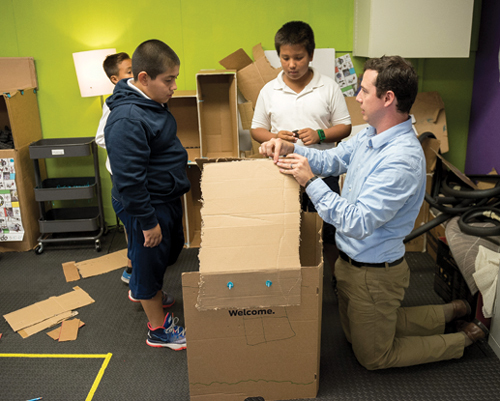 School Library Journal | How Fair Is Your Maker Space? All students should be able to benefit from maker spaces and maker education, which emphasize student-driven learning and foster the development of 21st-century skills. However, not all maker spaces and activities are created equal. Some feature high-tech equipment such as 3-D printers and scanners, programmable robots, mini-computers, and high-tech construction toys—equipment carrying a hefty price tag that not all schools can afford. In addition, maker space activities may cater to certain kids’ interests but not others—including dynamics that educators might not even be aware of. Plus, is self-directed learning the best type for all kids? Here are answers and ways to address these issues. How can schools with limited budgets invest money in fancy tech for a maker space? One answer: They don’t have to. Low-cost and free options include donated equipment, recycled and upcycled materials, low-tech and no-tech options, and bargain-bin electronics, all of which can enable a high-quality experience. Last year, the Montour School District in McKees Rocks, PA, set up its first maker space in an elementary school library in one day. Justin Aglio, director of innovation for the district, recruited a teacher and a parent to help. At 8 a.m., they began collecting materials, and by the end of the day, a maker space was ready for students. They began inside the school, where they asked teachers to donate unused equipment and supplies. Next, they visited local businesses, including a Barnes and Noble that donated a large LEGO table. The school also held a maker drive, sending out a letter asking parents to donate materials, from empty toilet paper rolls to unused toys. “A lot of those things we have in our space are items that they would have thrown away or were broken,” Aglio notes. of a cardboard roof, incorporating Makedo tools. Pronovost says no-tech and low-tech activities support the element of discovery through play, and under an adult’s guidance, that play can be woven in with the Next Generation Science Standards. 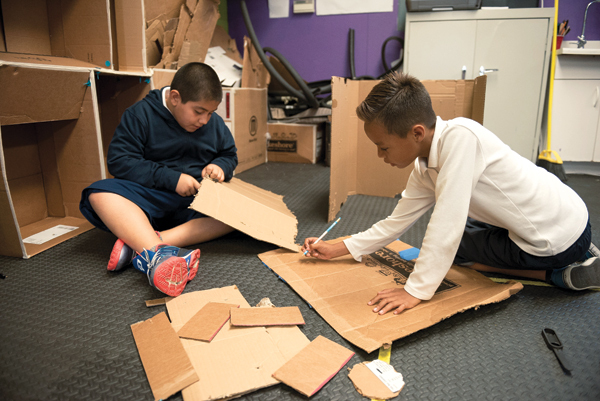 With the no-tech cardboard city, for instance, students used engineering skills to ensure structural integrity, and they exercised empathy—considering how others would use the structure and how to make it visually appealing. Paper circuits are low-tech projects with a high learning return. According to information from the Exploratorium in San Francisco—a public learning lab for science, art, and human perception—students can use copper tape and surface-mount LEDs to make a fully functional circuit on a flat surface, such as a piece of paper. Pronovost notes that slug tape—made of copper to deter garden slugs—is a lower-cost alternative. One advantage of low-cost, low-tech or no-tech materials is that kids can keep their creations. 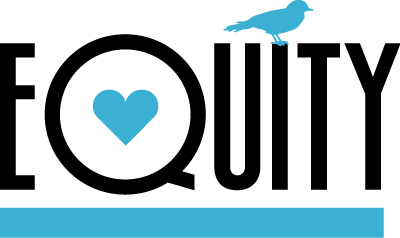 “It can take a bit more time to do something such as paper circuits, [but] the ability to bring it home and to engage their parents and siblings in conversation about it is more valuable than that time I’m saving by getting more easy-to-use materials,” Pronovost says. Leah Buechley is a designer, engineer, educator, and former professor at the MIT Media Lab. In a 2014 talk at the Eyeo Festival, a conference on art, interaction, and information, she presented an analysis of Make magazine and its associated community. Buechley discovered that the latter was overwhelmingly dominated by wealthy white males and the interests of that demographic. She maintains that for the maker education movement to be credible, it must appeal to and celebrate the interests and talents of the broader population, whether that means embracing activities such as auto mechanics, pottery, mashing up audio tracks in hip-hop music, or something else beyond the typical 3-D printing, robotics, and electronics. When planning maker spaces for young people, schools need to be careful to avoid the tendency of the maker movement to cater to a specific segment of the population. 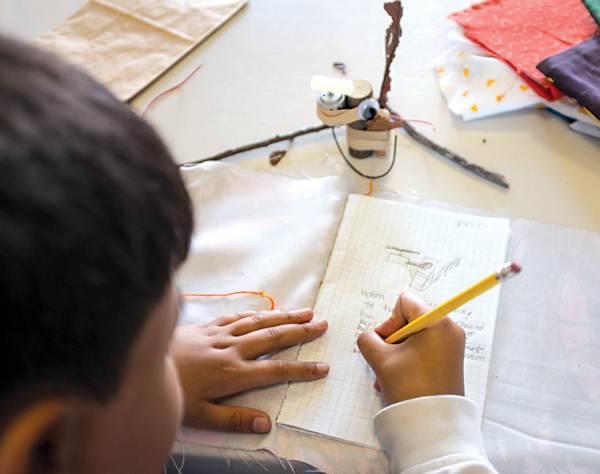 An Exploratorium Tinkering Studio participant writes about his “nature-bot,” a motorized sculpture made of natural materials and simple electronics that moves and dances. Also mindful of these dynamics is Shirin Vossoughi, assistant professor of learning sciences in the School of Education and Social Policy at Northwestern University. “It’s important to think about the how and why of those tools, and also [to] think about how the curriculum and the learning is going to be connected to their lives,” she says. According to Vossoughi, educators can create more equitable maker spaces by reconsidering their definition of making, as well as activities, materials, and tools, in order to embrace historical and cross-cultural practices. “Rich forms of making, building, crafting, and artistic activity exist already in a range of ways within all communities,” she says. “So what does that mean for how we design making programs and activities in ways that draw on the range of intellectual, cultural, and artistic resources and experiences that kids bring to this setting?” She points to examples such as children watching or helping as a family member fixes electronics, furniture, or bikes, or engages in home repair or sewing. Shea says that one way schools can create maker spaces that resonate with more students is to view parents and community members as experts. Those individuals may have expertise in various cultural practices of making, trade skills, or skills related to repairing or repurposing objects. Shea has been involved with numerous maker spaces in schools and an after-school program in the Tinkering Studio at the Exploratorium in San Francisco. She thinks there are a lot of ways these trade skills and cultural practices that have been going on for a long time in the local community can be connected to new technologies within a maker space. “The combination of old and new is a special way to think about making that I think can get lost on new start-up maker spaces” when people focus on buying new materials, Shea says. She highlights sewn circuits—wearable electronics—as an activity that can connect local culture with new tech in a way that might resonate with students. Students use materials such as conductive thread and tape, LEDs, and batteries to create items such as wrist cuffs and badges that light up. “It’s not too far of a leap to start thinking about sewn circuits as connected to skills associated with repair or tailoring, but they also can be connected to new technologies,” Shea says. Baking bread in a solar oven is another activity Shea likes. Community members with expertise in baking bread teach students about ingredients and preparation so bread will rise properly, and students take on the engineering challenge of building a solar oven. “Combining older ways of doing things with newer ways really becomes part of the magic of the space,” she says. During their research, Vossoughi and colleagues examined the moment-to-moment interactions between teachers and students. They wanted to find ways to support students as they engaged in open-ended making activities in a way that honored their individual creativity while also deepening their thinking and learning. Vossoughi says it can help if educators have the opportunity to engage in making activities themselves—and reflect on what the process was like for them as learners. “That can be a great form of professional development,” Vossoughi adds. 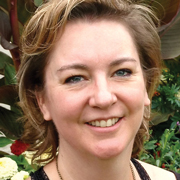 Leila Meyer is an education and tech writer in British Columbia, Canada. Enjoyed this article. Where can I get a copy of “Making Through the Lens of Culture and Power,” a Harvard Education Review paper. ? Tried ILL.